Now this $9.99 device claims to be the smallest USB 2.0 hub in the world, helping you connect more peripherals to the PC without taking up too much desktop space. 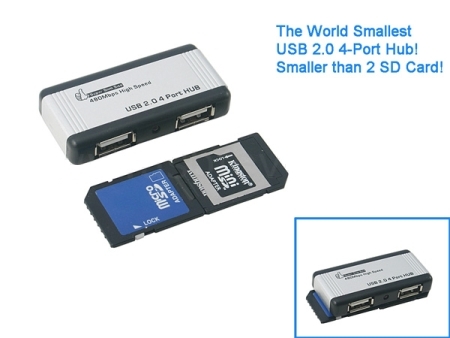 It measures an extremely tiny 5.8mm x 28mm x 12 mm and manages to cram in four USB 2.0 ports. As you can see, it is shorter than the length of two SD cards, weighing a mere 21 grams to make it travel-friendly. It isn’t made out of cheap plastic though, boasting a high-grade alloy with a metallic silver surface for that added touch of class.